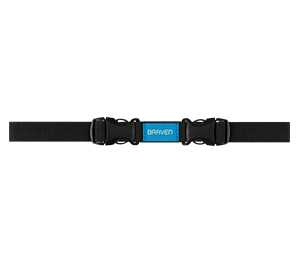 Designed for outdoor enthusiasts, the Braven BRV-X booms with 12 hours of music play fit for rocky canyons, powdered slopes, raging rapids, sandy dunes or even backyard barbecues. The BRV-X is designed with an IPX7 certified waterproof , shock absorbent, portable body and features a powerful 5200mAh power bank to charge external devices. Customize your listening experience for any environment by choosing indoor or outdoor mode. For an immersive left and right stereo experience, pair two Braven BRV-X speakers together using TrueWireless™. The ultra-rugged BRV-X rocks the outdoors with an IPX7 waterproof exterior and shockproof rubber exterior. Connect a Bluetooth enabled device to the BRV-X to wirelessly play audio. Thread the included strap through these aluminum posts. Securely attach your BRV-X on almost anything to enhance your outdoor adventures with portable tunes.